C&S Suet Treats are produced by melting the highest quality beef kidney fat, blending a variety of seeds, nuts, and fruits that are then poured into a tray and allowed to harden. Treats will become soft and pliable at 100° F if exposed to extreme heat during shipping and storage, but will return to normal hardness again at room temperature. C&S’s quality and special processes allow suet to be fed year round resulting in all season suet feeding success by our consumers. Ingredients: Rendered Beef Suet, Corn, White Millet, Oats, Milk, Sunflower Meal. Treats will become soft and pliable at 100 degrees if exposed to extreme heat and will return to normal hardness at room temperature. 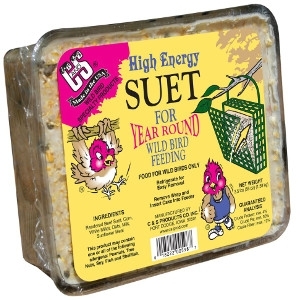 Our high quality allows suet to be fed YEAR ROUND.